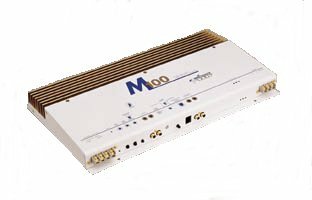 What year where the M series amps produced? How much power does my M series amplifier make at 2 ohms bridged? The continuous power at 2 ohms or 1 ohm bridged remains about the same as it was for 4 ohms bridged. 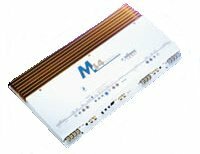 The M series amps have a circuit that detects the amount of current leaving the speaker terminals. If the current is high enough, AND lasts long enough (longer than 50 milliseconds), the circuit limits the amount of voltage that the power supply can produce. This in turn limits the power output of the amp. So continuous power output remains about the same with the power composed of more current and less voltage. If you want to run the amp 2 ohms bridged, go for it. Just understand that it will run warmer (fans may be necessary) and will pull more current from your car to make those musical peaks (add more capacitors). I wouldn't recommend running it 1 ohm bridged. The amp will shut down (red LED) if the output current gets too high (looks like a shorted speaker). Last modified: Thursday October 21, 1999.